We were asked by Canary Wharf to supply and fit out our 220mm wide walnut flooring which is a mixed grade ABCD. However they wanted a more select floor which we were able to do by supplying 20% to 25% more than required to create a stunning near virtual Prime Black American Walnut floor at a fraction of the cost. A lot of other trades were also completing work at the site including the fit out of show apartments for the Wood Wharf Development. This meant that the floor had to be covered to protect the surface. 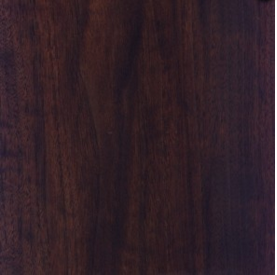 The product was our E515 which is a 15mm thick oiled walnut. As you can see even after covering there was still a lot of dust and dirt on the surface after the protection was removed. This is normal at such sites where machining of timber and ceramics has to be undertaken to complete installations of bathrooms, living areas, bedrooms and kitchens. By using an oiled finished board it is easy to clean and then finish with a coat of oil to bring the beautiful lustre and colours of the walnut to the surface. The floor was cleaned with one of our professional products and then a coat of oil applied. This is not necessary on our UV Oiled floor finishes but with Walnut we will only use an industrial lacquer or hard wax oil to seal the surface. If you have a finished site with no other work to be carried out after the floor is fitted then you can use a lacquered floor. In cases like this one we would only use an oiled floor because we can then create whatever look you require afterwards. The images below show the difference after the floor has been cleaned and then a coat of oil applied. This process is simple for a professional experienced fitter and not costly. The natural light really shows the beauty of American Black Walnut Flooring and by using a skilled professional fitter the boards are selected during installation so that they blend in to create the stunning floor you see here. The product installed here is our 220mm wide, 2200mm long, 15 mm thick ABCD grade engineered walnut where you can see fitted pictures of the product without the selection process used in this Case Study.